I try and read as much as possible when I’m at home but going on holiday is the perfect time to really plough through a few books that have been on the shelf for a while. In the same way that I like to share the good beers that I drink, I want to share the good books that I read, especially when they are about beer. Pete Brown’s Three Sheets To The Wind. I’d been meaning to read this for ages but don’t get through huge amounts of nonfiction at home. But I love nonfiction while reading on the beach. 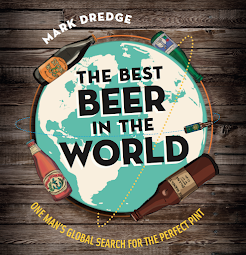 Three Sheets is Pete’s world-wide search for the meaning of beer. It’s funny, it’s ridiculously well observed, it’s well researched and a joy to read. I get through a lot of beer reading and can honestly say that I learnt more from this than anything else I’ve read. It made me think about the personal essence of beer and drinking, and about why I love it so much. It gave me massive wanderlust. Pete Brown’s Hops and Glory. I finished Three Sheets then went on to Hops and Glory. This is an epic book in so many ways. The story itself is huge; brewing and taking a cask/keg of beer from Burton to India via sea. The history and the research is also epic. It’s doctoral thesis scholarly but in the most readable of ways. It’s got Pete’s laconic humour, his fragile sense of emotion and being and a true beating heart. It's an energetic travelogue and it’s filled with the type of descriptive prose that nineteenth century romance novelists would be jealous of. I could wax lyrical on and on about this… but as someone who wants to write and who loves beer, Hops & Glory is a brilliant inspiration. Sam Calagione’s Brewing Up A Business. If you want to work for BrewDog then this book is part of the training. It’s Sam’s guide to running a small business and it’s filled with so many great stories about Dogfish Head Brewery. I laughed my way through this, I fell in love with his hard-working ethic, his charisma, his desire to succeed and I was completely inspired again. Whether you want to start your own business/brewery or you just love beer, this is a book to read. Tim Lebbon’s Bar None. Tim is part of the Blog O’ Beer crew. He is also a successful novelist. I got an email a while back asking if I’d like a copy and said yes. It arrived two days before I left for holiday so it was squeezed into my hand luggage. It’s the post-apocalyptic journey of a handful of survivors to the safe haven of a pub. And beer is very important. The protagonist can only remember his wife when he drinks and it’s both heart-breaking and heart-warming at the same time. It’s a great walk through memory and time and place and people and I really liked it. The joy of this book is in the way that memories are linked through beer, kind of like the Taste of Memories. Next I read two non-beer books by Malcom Gladwell. I read Outliers just after it was released and then bought Blink and Tipping Point. Let me say this: I think Malcom Gladwell is one of the greatest writers of our time. He thinks in a way and with a precision of mind that is impossible to comprehend until you read his words. Blink is about the moments when we know something without knowing why - it’s that snap judgment in the blink of an eye. Tipping Point is about the ascension to a moment where a thing ‘tips’ from being unimportant to incredibly important. Outliers is the story of why some people achieve so much more than others. All are awesome feats of academic and psychosocial thinking. If you haven’t read any Malcom Gladwell then you really must. Chuck Palahnuik’s Invisible Monsters was the last book and I’ve been reading a lot of his stuff recently. This is my favourite book by him; it’s brilliant. 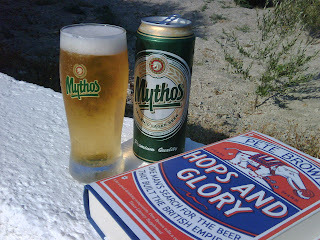 Some of the best moments of my holiday were sitting down in the evening sun and opening one of these books and a cold Mythos. I really do love sitting in the sun, reading and drinking a cold beer. In fact, as it’s a gloriously sunny day today, I think that’s how I’ll be spending my afternoon and evening.